Mrs. Obama signs a 15th birthday card for KaBOOM! 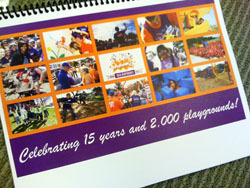 We were touched to see over 400 people send KaBOOM! 15th birthday wishes via our online card! We brought a 171-page (!) 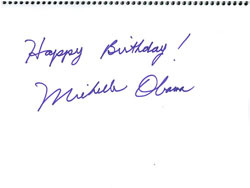 printed copy to our 2000th playground build on Wednesday, June 15 so that the First Lady herself could add her signature and birthday message. 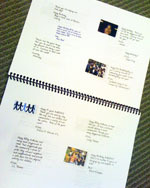 If you haven't signed our card yet, it's not too late! Click here to send your birthday wishes. KaBOOM! is also happy to accept birthday gifts, which will be sure to put a smile on a child's face. Each gift will help us build our next 2,000 playgrounds so that we can get one step closer to our vision of a playground within walking distance of every child. Click here to send your gift. Join the First Lady and our staff in wishing KaBOOM! a very Happy Birthday!